Don’t you think it’s great to have a lot of customers attached to you from all over the country or even all over the world? Yes! It’s an amazing feeling to remain connected with a lot of customers but is it possible so to make it out? Yes, it is, that is the real power of email marketing, it can grow and increase your customer list faster than any other marketing technique. But some small bugs can ruined a lot. So, definitely, email marketing in present date is the most cost effective and beneficial marketing technique but there are some mistakes which can downgrade your marketing result. 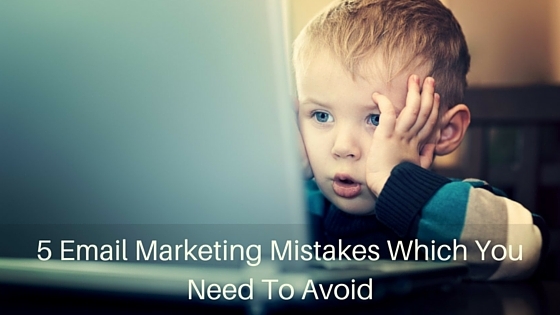 Here are the 5 email marketing mistakes which you need to avoid. 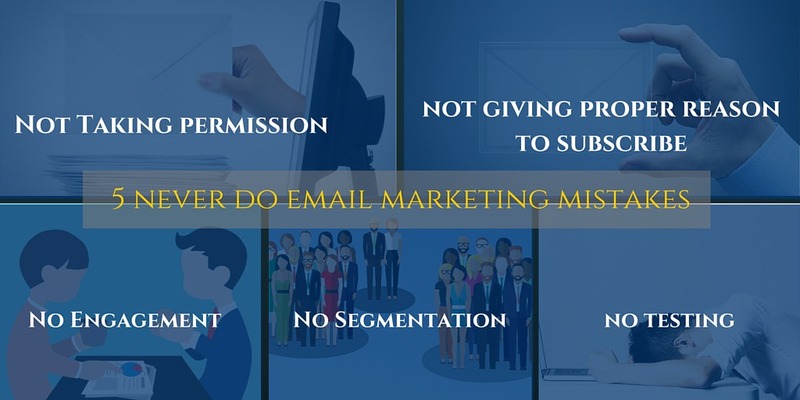 The way from a good marketer to a spammer is very simple and it’s very easy to kill your email list, the only thing you have to do is to start sending emails to people without their permission. If you want to protect yourself from the tag of a spammer and get into the habit of taking permissions. Not only you can become a spammer but it can also take you against the law. Some of the reputable email service providers use a “double opt-in” system that protects you from emailing people without full permission ever.So, start building your own email list, if you want you can use the platform of Social Media To grow your email list. Giving a proper way to subscribe is very important because we don’t know that why the visitor is roaming through your website maybe he is in search of your products or it can be possible that he is visiting to read your blogs. So we never know the reason behind your visitor’s visit. So, just passing a small box of subscription is not enough to grab all your visitors. Give them all the opportunities to subscribe. If you have a huge list yet you’re not able to contact them then that list is of no use. So it’s good to give 5 minutes daily rather than investing an hour weekly. Trust me, if someone has subscribed to you this means that they want to see you and listen to you and if after making them subscribers you are not paying attention to them, then you’re inviting the unsubscribed tag to you. Related Post: Learn The Art of Developing Strong Relationship With Subscribers! Creating an email list is not the only task, it’s just a beginning while obtaining the email list it’s not necessary that the visitors subscribing you has the same need. They can have different needs or different categories. So start segmenting your email list. For example segmenting the email list in accordance with location or profession. By segmentation, you will start noticing your lower subscription rates. So, start noticing the different behaviour of your different customers and segment the list and send the emails which they want to receive. At very last when you’re you’ve segmented your list, you’re done with the subscription and you’ve correctly followed all the four points mentioned above, the worst thing which can ruin all your efforts is the small mistakes in your email. Trust me, it affects your brand image when the email you have sent is not getting opened in the mobile devices or there is a silly spelling mistake. So always test your email before throwing out it for your subscribers. If testing seems to be very difficult for you then start using tools for email marketing which can help you in checking from A to Z of your emails. These were the basic 5 mistakes which can affect badly your basic steps towards Email Marketing. So, if you have decided to get into the Email Marketing. So, keep in your mind that even by mistake you don’t have to do these mistakes.